If I were to look at Mortal Engines (2018) critically, I’d notice a number of flaws. From fairly flat characters to a string of movies and directors that it tries to imitate, this film should be terrible. And yet, given that I’d already suspended my disbelief by entertaining the idea that an apocalypse would result in cities mounting up on enormous machines and scavenging smaller towns for fuel, I found this movie incredibly entertaining. Perhaps the base plot isn’t too original, but the execution felt fresh and new. Somehow, I was able to turn off my critical brain and just enjoy this movie for what it is: pure, unadulterated fun. As someone who appreciates film as an art form, there is plenty of it on display here. The look, feel, and aesthetic of Mortal Engines is so bold and consistent that the core concept of the plot naturally follows. The visuals and soundtrack merely accentuate the action and drive it forward in a way that allowed me to lose myself in the fantasy. And perhaps that’s why I liked this film: there have been very few fantasy or sci-fi films that have tried to push that creative envelope. Sure, it’s not a “safe” movie that plays to conventions. It attempts something new and more or less succeeds in bringing it to life. In the end, I didn’t care that Mortal Engines likely stole inspiration from Mad Max: Fury Road (2015), Snowpiercer (2013), Stardust (2007), Terminator (1984), and an endless litany of Terry Gilliam films. I didn’t care that it was basically the plot from Star Wars (1977). I like all of these movies, so the fact that Mortal Engines was able to combine them all into something that still made sense was a plus. Heck, I appreciated that it didn’t have to explain itself. Sometimes explaining something ridiculous like this ruins the magic of it. 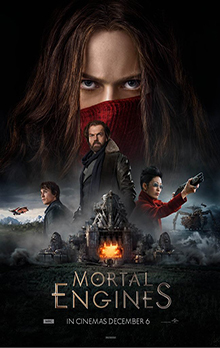 A mold-breaking film that was fun to watch, I give Mortal Engines 5.0 stars out of 5.